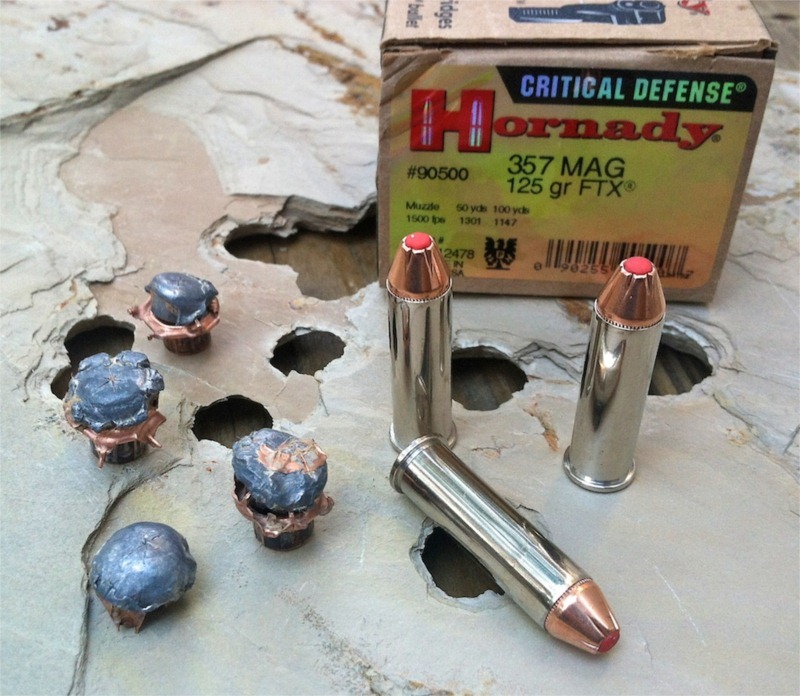 You are here: Home / Ammo / Ammo Review: Will Hornady Critical Defense Ammo Expand in Rocks? We’ve had great success getting Hornady’s Critical Defense ammo to expand after passing through all sorts of crazy things – plastic, old garage rags, honey bears, Wal-Mart house brand grape jelly, spam, flour, e-mail, leather boots, canned vegetables, and more. So we figured it’s time for the ultimate test. Rocks are hard and as we figure, tough on ammo. And you need to know if your ammo is going to perform should you ever encounter an evil d00d wearing a protective vest made of rocks. When it came time to head to the range, we found actual rocks to be a bit problematic as they are big and heavy and somewhat uneven. And you know how scientific we are are about these things. We need repeatable uniformity. Sounds sophisticated doesn’t it? Repeatable uniformity. So we elected to use some stone floor tile that we had laying around in the garage. Because it offers repeatable uniformity. And because it doesn’t seem to match any of the floor in our house. Apparently we stole it from the neighbors while they were distracted by the True-Green lawn guy. As we’ve already discussed, rocks are hard. 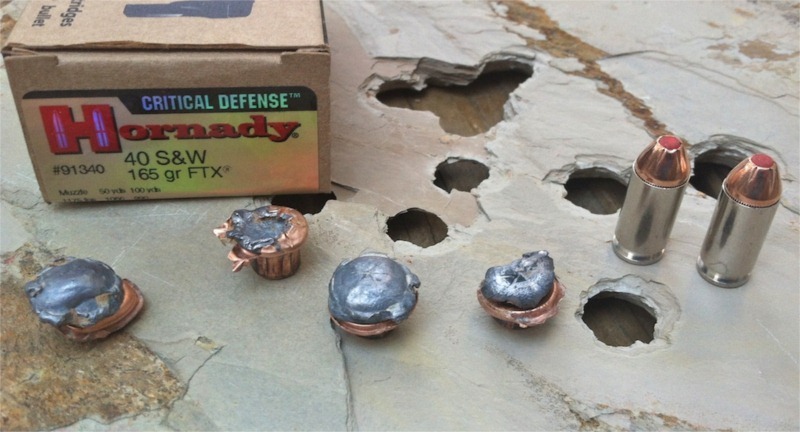 So we went full octane – .357 Sig and .40 S&W. Out of a Glock 32 and Beretta PX4 Storm respectively. Surprisingly, both the .357 Magnum and .40 S&W Critical Defense loads expanded properly after passing through, well, rock more or less. The point is… Now you know not to put stone floor tile in your ballistic vest. It won’t help you. You can buy Hornady Critical Defense and Critical Duty Ammunition here. 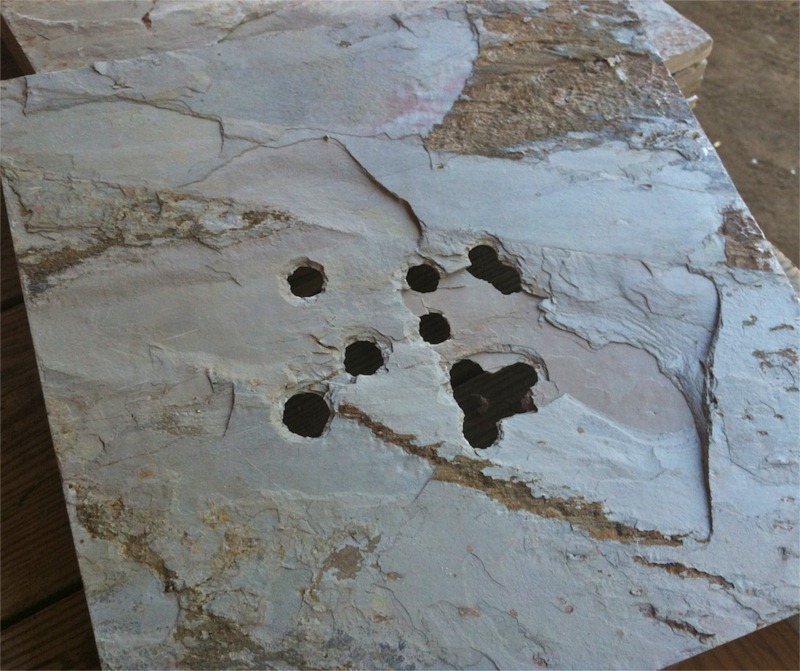 I tried it with 4 inch ceramic tile on concrete backer board. It didn’t stop the bullets either. Exploded nicely though.